What would an Italian christening party, graduation, or even a wedding be without an accordionist! In our latest Personality Profile, Ciao Pittsburgh had the opportunity to interview one of Pittsburgh’s premier professional accordionists, Hank Edwardo. Hank, a lifelong resident of Bloomfield, has both Italian and Irish roots. After his father’s parents emigrated from Roccacinquemiglia in Abruzzo, they settled in Bloomfield and raised a large family from a small home on Juniper Street. Hank’s maternal grandparents were first generation off-spring of a large Irish family with roots on the North Side. 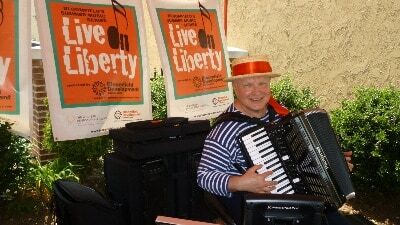 As a retired civil engineer, Hank is now enjoying his avocation as a professional accordionist, as a “one man band,” as well as the joys of being a father and grandfather. Hank still lives in Bloomfield in the house he and his brother grew up. He decided to stay in Bloomfield and basically rebuilt the house to his liking. Despite his hectic schedule, he was generous enough with his time to address some of our questions. CP: What do you find to be the most rewarding aspect of playing music? Hank: I’ve been entertaining family, friends and coworkers for over 40 years in various social settings playing an accordion, which by its design can allow one person to be both melodic and rhythmic. It’s a true party instrument. The reward was always being able to add fun to a setting and feeling proud that people liked that. Now playing professionally, the rewards also include a higher sense of accomplishment in being able to perform in more structured and demanding situations and keeping my skills at a higher level. Hank: All my life (66 years). Pittsburgh is big and urban enough to offer whatever social and cultural needs I have yet small and rural enough to enjoy nature. Also, your housing dollar goes a long way here. Hank: My childhood was mostly influenced by my father’s Italian side of the family and was typical of a second generation Italian-American family of the 1950’s and 1960’s. I only heard Italian being spoken when we visited my grandparents and the most Italian aspect of my youth revolved around food traditions. In my career as an engineer, I established friendships with several individuals who had strong Italian roots. These people introduced me to Italian culture in ways that were foreign to me as a child. My first boss coming out college was Armando Lardieri who was almost like a father and very grounded in all things Italian. He also involved me in a large family of Italian friends, most of whom were immigrants. One of these people is Sal Patitucci, the host of Radio Italia here in Pittsburgh (since 1964!). 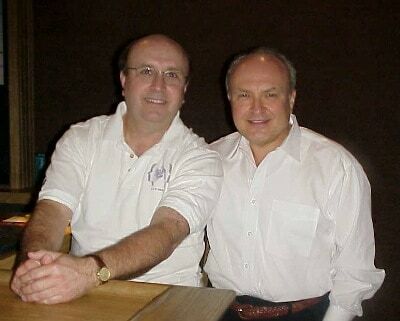 We worked together for over 30 years in an engineering setting and through our friendship over many years, I have come to develop a better understanding of being Italian and appreciating Italian culture. Sal is not only a good friend but he has been central to my current career as an Italian entertainer. Hank: These most certainly revolve around food. I enjoy cooking and preparing the Feast of Seven Fishes. Hank: Not in person (yet). But through Google Earth I can walk along the streets of Roccacinquemiglia. Hank: Being Italian means to see friendship in a way a lot of people may never experience. The most fundamental characteristic I see in people with strong Italian roots is the value they place on friendship above all else. Hank: I enjoy a wide variety of ethnic foods and anyplace that can make Eggplant Parmigiana the right way. When I do eat in a restaurant it’s usually not for Italian food. If I want Italian food I prefer to eat at home. Hank: I had a very successful career as an engineer and project manager and those accomplishments were very rewarding, financially and psychologically, yet they are in the past. Being a good son, father, grandfather and brother are what I work at the most. Hank: Trying to stay in shape, biking, kayak fishing and a constant quest to be a better musician. Hank: I rarely go to a movie theater. Hank: The Great Chefs of Europe (I wish it was still on!). Hank: I love to help you laugh at life with me! To learn more about Hank or to hire him for your next event, visit his website at www.edwardomusic.com..